elanie Safka was born in Astoria, New York, where she learned to play the ukulele at the age of four. There was always music around the house -- her uncle sang folk songs; her mother, jazz and blues. At sixteen, Melanie was already singing in nightclubs and coffeehouses. She also studied drama for a while, at New York's Academy of Fine Arts. One day in 1967, she went to a building on Broadway, looking for an acting audition. The doorman, seeing she was carrying a guitar, misdirected her instead to the offices of Peter Schekeryk, a producer for Columbia Records. Schekeryk auditioned her and signed her to the label, and in the process, Melanie met her future producer and husband. 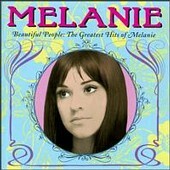 Melanie recorded four songs with Columbia, including a single called "My Beautiful People." When the record failed to sell and Melanie was dropped by Columbia, she and her husband signed with Buddah Records. Not much happened until the fall of 1969, when Melanie sang at the famous Woodstock festival. As it began to rain, hundred of candles suddenly appeared, glowing in the darkness. From that experience came her first hit, "Lay Down (Candles in the Rain)," which she recorded with the Edwin Hawkins Singers. Later in 1970, she made the Top 40 again, with "Peace Will Come (According to Plan)." In 1971, Melanie and Peter formed their own label, Neighborhood Records. The first release was a single -- "Brand New Key." "I like all kinds of music," she said, "but what I like best is to blend different styles so well in one song that both the song and I transcend categories. I hate being pegged as anything -- country, pop, whatever. The trick is to become a timeless musical being, with timeless musical songs. "'Brand New Key' I wrote in about fifteen minutes one night. I thought it was cute; a kind of old thirties tune. I guess a key and a lock have always been Freudian symbols, and pretty obvious ones at that. There was no deep serious expression behind the song, but people read things into it. They made up incredible stories as to what the lyrics said and what the song meant. In some places, it was even banned from the radio. "My idea about songs is that once you write them, you have very little say in their life afterward. It's a lot like having a baby. You conceive a song, deliver it, and then give it as good a start as you can. After that, it's on its own. People will take it any way they want to take it." "Brand New Key," the first single from her album Gather Me, broke on American radio in October 1971 and reached the top of the charts in December. For nearly four months, confused record buyers flooded the stores asking for "The Roller Skate Song," "I've Got a Brand New Pair of Roller Skates," and even "The Bicycle Song." Fortunately, all finally were steered to the right record. "I used to love singing 'Brand New Key,'" said Melanie, "at first. It had great shock value, dropped in the middle of one of my concerts. I'd be singing along about Suffering and the Trials of Man, and then suddenly, 'I've got a brand-new pair of roller skates...' It had a great effect. After it became a hit, though, the fun kind of wore off, at least for me. Some things, I think, are better left a surprise." A few years after the success of "Brand New Key," Melanie's eldest child, Leilah, was born on October 3, 1973. The story goes Melanie was listening to tapes during childbirth and decided to name her firstborn after the song that was playing at the time, the classic rock standard "Layla" by Derek & the Dominos. During the eighties, Melanie changed both musical direction and record labels several times. In 1993, she released a double CD called Silver Anniversary Unplugged, to celebrate her 25 year recording career. In August 1994, she performed at the gathering at the original Woodstock site. Although not as successful as before, Melanie still has a secure fan base and manages to do sold out gigs all over the world. On November 26, 2010 Melanie's longtime husband Peter Schekeryk, who produced all but one of her albums, passed away while holiday shopping in Framingham, Mass., at the age of 68. On her blog, Melanie spoke eloquently about her 45-year-long marriage, the circumstances of finding out about Peter's death and the talk she had with the store employee who was helping him when he became ill, and a planned book: "So Peter wanted me to write a book and I never could start or rather, I could start and never continue... [This book] will be Peter's story, immigrant refugee to number one producer of Melanie, the love of his life. That crazy Peter, sometimes you can't see it's a story 'till it ends, the greatest love story never told."